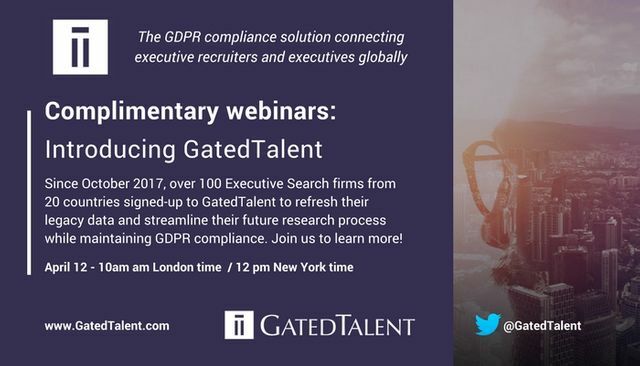 GatedTalent, the GDPR compliance platform that allows executive recruiters to discover and connect with the world’s talent, has seen an unprecedented demand from Executive Search firms globally as highlighted in the recent stock exchange announcement. GatedTalent has also been shortlisted for 2018 Recruiter Awards in the RECRUITMENT TECHNOLOGY INNOVATION OF THE YEAR category. Join one of the webinars taking place on April 12 to learn how the platform can help your firm refresh your legacy data, help make you GDPR compliant and streamline your future research process.